When you plug in a hair dryer, electricity moves in a circuit. It first flows on a ‘hot’ wire from the source to the appliance, where electrons turn the motor that makes the hot air blow. The electricity then flows back on the ‘neutral’ wire to the nearest ground, which is the third prong on your outlet. It’s like water powering a water wheel. Water flows from the source to the wheel, turns the wheel, then falls back down to the stream. Shocking Interruption. Suppose, however, that you stick your hand in water while the hair dryer is off. When this happens, the nearest ground is no longer your outlet plug. You become the nearest ground, which means that the flow of electrons will go into your body. In electrical terms, this is called a ground fault. It’s a shocking reality. Shock Proofing. Plugging an appliance or tool into an outlet with a ground fault circuit interrupter greatly reduces the risk of shock from a ground fault. The GFCI monitors how much power is flowing to and from the device, and if it detects an variance in the circuit, it cuts – interrupts – the power totally. This is why you’ll see the special GFCI outlets in places where there is a water source – whether inside a kitchen or bathroom, or outside where there may be standing water on the ground. A GFCI outlet has a built in test and reset button. And it should be tested often, because they eventually wear out. To test, plug in a nightlight, press, the ‘test’ button, and make sure the light goes out. Press reset, and it should light up again. If it doesn’t, it’s time to call us. Actually, if your home isn’t equipped with GFCI’s in your kitchen, bathroom, and outdoor areas, you should give us a call anyway. 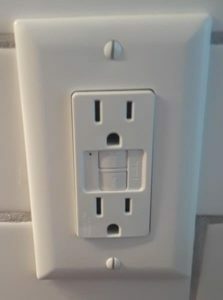 We can install these for you, protecting you and your family from being shocked. 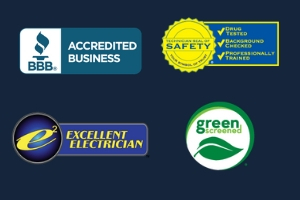 Call us today, and let us come give your home an electrical inspection. GFCI’s notwithstanding, people are often shocked – in a good way – by the friendly, efficient and professional service that you get from Aspire Electric!